The Birthday Workout: do what you can, because you can. 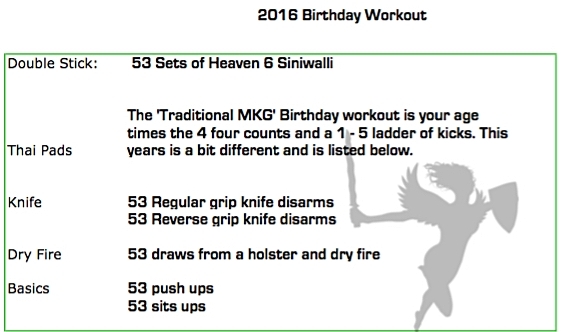 The tradition of a birthday workout has been a part of my martial arts experience since I turned 30. That year and on that day, I became the first member of the MKG "Ten Round Club”*. For my 30th birthday Muay Thai experience, I was 'lucky' enough to have four scary, phenomenally talented martial artists as holders for this grueling test: Rick Faye, Vanessa Herbst Larson, Greg Nelson and David Leitch. I was the most nervous for Greg and Dave's pad holding, as word of their fierce ring prowess was intimidating as hell. Surprisingly, they were my easiest and nicest holders. Rick had the scariest "I will rip your head off your body and shove it down your throat" tester face that I will never forget. And Vanessa... Vanessa smacked me the most and by far the hardest. (Vanessa and I had trained for months to prepare. She made sure I knew it was NOT a regular training day.) Once it was over, the added bonus of distraction from turning the ‘old age’ of 30 was pretty great too. If I can, and I'm lucky enough to have a holder, I still do the drill rounds format a couple times a week. Now I only do 4 or 5 rounds, though. I still do love/hate it. From that year on, the tradition of a strenuous Muay Thai workout on birthdays became a thing in the school. Rick Faye detailed the workout to be your birthday age times 1) the four 'regular four counts' and 2) a ladder of 1 - 5 Thai kicks. Kicker and holder both do the birthday kicker's age. (I proposed that at 50, we should reduce the number of sets each year by one repetition; that way when turning 99 you’d only have to do a single set. A great idea. Answer: ‘No.' In my humble opinion, it's still a great idea but since 50 has come and gone, each year I explore new additions and ideas for "The Birthday Workout". While the reduction in reps option got deep sixed, I did learn a couple things from asking the question. First, don’t ask, just do it. Second, with the annual increase in reps, I wanted to change the format to accommodate both my variable conditioning and whatever injuries I had to navigate when October rolled around. My attention span issues (read: boredom) added a pretty strong drive to make it more interesting, fun and productive. The answer: add categories. Leg, foot and knee injuries? Add weaponry, Jiu Jitsu drills, focus mitts, CSW submissions, trapping, disarms and flow drills. Above are pics from last year and this year. And, of course, this year’s workout is listed too. * The 10 Round Club Test is based on a Muay Thai training format called "Drill Rounds". Drill rounds are designed to challenge your defensive capabilities, stamina, body mechanics and mental fortitude while improving your recovery time. It has a rhythmic drill based structure. A variable defense called out by the holder is followed by an offense of rotating body parts (kicks, knees or elbows). All done at a sprint pace. Each round is 3 minutes and is followed by a 15 second kicking sprint at the bell. 45 seconds or so are left for recovery between rounds. For the test you get fresh holders every few rounds. One of the more hideous tests I watched involved the holder putting the same song on 'repeat' for all ten rounds. It was a country music song. The test takers were from England. Funny. Wrong, but definitely funny.